Jason Witten has made a name for himself as one of the top tight ends in all of football, as well as one of the NFL's most generous players. In 13 seasons with the Dallas Cowboys, Witten has become the team's all-time leader in receptions, set the NFL record for catches in a season by a tight end and has been selected to the Pro Bowl 10 times. But Witten's accomplishments off the field are perhaps even more impressive. Through his own charitable foundation, Jason Witten’s SCORE Foundation, Witten has launched numerous outreach programs and funded several new building projects in Texas and his native Tennessee. Seven years ago, the foundation launched the Jason Witten SCOREkeepers program, a unique initiative placing full-time, trained male mentors in battered women’s shelters throughout Texas. The mentors seek to demonstrate positive male behavior to the children living in these shelters in an effort to break the cycle of violence that plagues families affected by abuse. 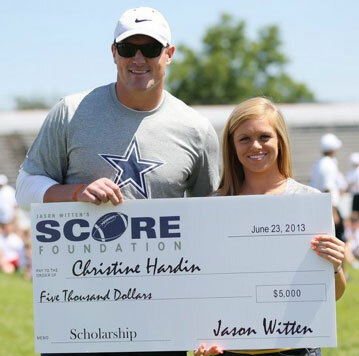 With the help of generous grants from the Allstate Foundation, Jason Witten’s SCORE Foundation has placed SCOREkeepers in six shelters across the Lone Star State — The Family Place (Dallas), SafeHaven (Fort Worth), Mujeres Unidas (McAllen), New Beginning Center (Garland), Denton County Friends of the Family (Denton Co.) and Safe Place (Austin). He also routinely hosts children from these shelters for special events like Christmas parties, bowling outings and trips to Cowboys training camp. In 2010, the foundation launched a new domestic violence prevention program called “Coaching Boys Into Men” in high schools across Arlington, Texas. The program trains coaches to educate their players on the dangers of dating violence. In addition to his distinguished work in the battle against domestic violence, Witten also built a Jason Witten Learning Center, complete with a state-of-the-art recording studio, at the East Dallas Boys & Girls Club center in March 2008. A month later, he dedicated another one at the Boys & Girls Club in his hometown of Elizabethton, Tenn. Then, he dedicated a third such center at the Halls/Powell Boys & Girls Club in Knoxville, Tenn., where he played college football at the University of Tennessee. In the early summer of 2008, Jason furthered his commitment to NFL Play 60 with a local media campaign in North Texas with the Ad Council. He cut radio and TV spots to run in the North Texas area promoting Play 60 during a summer media road block. He also spoke at the press conference hosted at Texas Stadium to help kick off the local campaign. A part of the press conference included youth from Boys & Girls Clubs of Arlington participating in physical fitness activities including Hoola-Hoop, Jump Rope and of course a little football! Since that time, Witten has strengthened his commitment to youth fitness by launching the Play.Move.SCORE program at Boys & Girls Clubs centers in Dallas and Fort Worth. The program, sponsored by UnitedHealthcare, is a year-long initiative to get kids active and eating healthy. This school year, Jason and the SCORE Foundation have partnered with Albertsons to feed 110 children each week at the Boys & Girls Clubs in Dallas and Fort Worth. The program provides sacks of healthy foods for these in-need children to take home on the weekends when they do not have access to healthy meals at school or the clubs. Last June, Witten once again returned to his hometown of Elizabethton, Tenn., to host the 13th Annual Jason Witten Football Camp. With approximately 1,200 kids attending each year, the camp is one of the largest free football camps in America. Jason and his wife Michelle, a registered nurse, also funded the construction of a brand new Jason Witten-themed emergency waiting room at The Children’s Hospital at Johnson City Medical Center in Johnson City, Tenn. The project was dedicated in 2009. In 2012, Jason became the first player ever to win the Bart Starr Award and the Walter Payton NFL Man of the Year Award in the same season. Previously, he was honored as the Pro Football Weekly Humanitarian of the Year in 2010. Those are big honors for Jason, but some of several he has received over the last few years. In September 2008, Witten was honored by the Texas Council on Family Violence as one of the 30 Stars Over Texas, joining Governor Rick Perry, US Senator Kay Bailey Hutchison, US Senator John Cornyn and former Governor Ann Richards, among others, as 30 people who have made a significant difference in fighting domestic violence in Texas over the last 30 years. That same year, Witten was named a Home Depot NFL Neighborhood MVP, honoring him for his extensive work in the community by building a playground in his honor at Inspired Vision Academy in Dallas. Witten worked alongside more than 150 Home Depot employees to build the playground, and he won the league-wide Home Depot Neighborhood MVP award in February 2009. In continuing his advocacy for the proper development of children — both inside and outside of the classroom — Jason has taken an elementary age youth to school for the last seven years as part of the NFL’s Take a Player to School program. Jason and Michelle have two sons, C.J. and Cooper, and two daughters, Landry and Hadley, and reside in Westlake, Texas.